A vestibular/balance disorder is often signified by disabling dizziness or vertigo. The cause may be a head injury, an infection in the inner ear or a dysfunction of part of the brain that processes balance and spatial information, this maybe general ageing or disease like MS or Parkinson’s. People may experience, a spinning or whirling sensation, light-headedness, the illusion of movement and nausea. 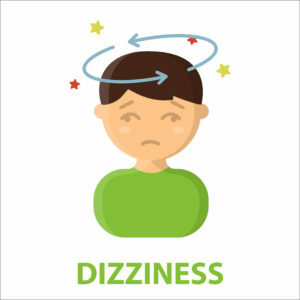 The type and severity of the condition may vary but can include difficulty walking in a straight line, stumbling, fear of falling, nausea or light-headedness. Often there is a fear of going out because this is an unseen problem, people are often mistaken for being drunk and are often very embarrassed about their unsteadiness. Also, daily activities such as shopping, going out in the car can be very difficult as these can bring on episodes of dizziness or nausea. People may also have problems with their eyes, this maybe in the form of tracking items, blurriness or light sensitivity. Everyone with a balance disorder is affected differently. We start off with a discussion about the history of the condition and how it affects you in their daily life. We then go through an assessment to identify which movements are triggers and where the balance problems are. We then develop a vestibular rehabilitation programme, which is a progressive programme of head and eye movements individual to you. It is important to re-educate the brain that these are normal movements and therefore we need to work gently into the triggers at a pace that suits you. The programme is adapted from Cawthorne –Cooksey exercise, and is highly effective in the treatment of Vestibular Disorders. Get in touch if you recognise any of these symptoms and one of our team will get back to you to see how we can help.